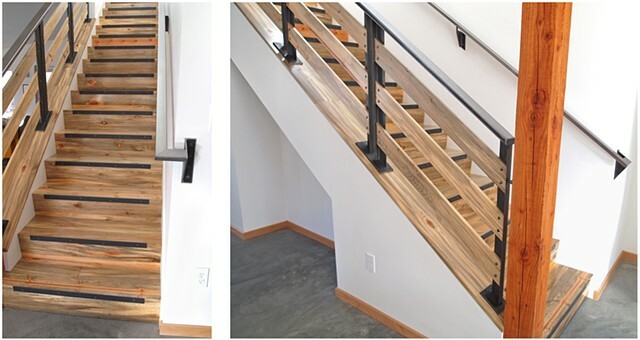 Two views of a staircase with a raw steel and wood guardrail as well as a steel handrail along the wall. Blue pine lumber was used for the guardrail as well as the stairs and wall cap. The stair risers are built with a 7º back slant and have steel flat bar nose edging. The stairs were designed and built by Andrew Traub (with framing help from Tony Mitchell, Zuma Canyon Construction), the guardrail and handrail were a collaboration between Andrew Traub and Johnny Weld, Opus Ferro.